We end the year with a smile on our face. It’s rare to get vindicated so thoroughly and have your opponent eat their own backstabbing personal attack words. Bill Wolfe … doesn’t know what we do. acting unilaterally and taking policy and regulatory positions on behalf of the Commission, without the knowledge or approval of the Commission or awareness of the public. This pattern of conduct was repeated in the NJ Natural Gas pipeline controversy. 3. [BPU President] Mroz stated that the pipeline was “approved by the Pinelands Commission” as consistent with the Comprehensive Management Plan (CMP). The Pinelands Commission NEVER VOTED TO APPROVE THE PIPELINE. The so called approval and CMP consistently determination was issued unilaterally by Gov. Christie’s installed Executive Director Nancy Wittenberg – not the Commission – who was following Orders of the Governor’s Office, not the direction of the Pinelands Commission or the requirements of the CMP. Wittenberg also directly participated in the fabricated fraudulent military need justification to evade Pinelands regulations. the CMP does not confer on the Executive Director or the Commission’s staff the authority to render final decisions on CMP compliance in these circumstances. There also is no provision in the Pinelands Act that confers upon the Executive Director authority to render a final decision for the Commission in the coordinated permitting process. The Court vindicated my criticism. So, given the Appellate Division’s decision, I wonder if Ms. Wittenberg still believes that I don’t know what the Commission does. Happy New Year – and eat your words, Wittenberg! (You can’t say I didn’t try to warn you and prevent this via an appeal to reason). See Part 1 (Jan. – March) and Part 2 (April – June). NJ At A Crossroads: Garden State or Pipeline State? As I noted in Part 1, we receive no Foundation, government, consulting, private environmental group funding, grants, or salary income. We accept no advertising revenue or reader fees. We work solo and rely on no “fundraising/development/promotional” or “public relations” staff flacks. We provide all this work for free. A Heartfelt Note To My New York Friends – Vote For Bernie! Mission Accomplished In The Pequannock Watershed? Does Back Room Open Space “Deal” Provide Cover for Democrats To Abandon Veto of DEP Flood Hazard Rules? Is Senate President Sweeney Playing Politics With Clean Water? Why Is NJ Media Keeping NY Gov. Cuomo’s Pipeline Kill A Secret? Overall, 2016 was a disaster – our greatest policy disappointments were the continued denial of climate change in Trenton and at the Pinelands Commission and the failure by the Legislature to follow through with the veto of the Christie DEP Flood Hazard rules, a dirty deal engineered by Senate President Sweeney – but we had fun anyway. Here’s some stories we wrote – while many were ignored by the mainstream press, we know we had an impact. We create content, offer expert analysis, and provide science and law based strategic and technical assistance to community and environmental groups that is unique in NJ. We testify before the legislature and hold accountable regulatory and planning agencies like the DEP, EPA, USGS, Pinelands & Highlands, DRBC, and BPU. We challenge regulations and permits. We support whistleblowers. We name names and don’t pull punches. We even criticize our environmental “colleagues” and media and the corporatized Foundations that fund and manipulate them. This work involves countless hours in the field and reading and writing. It is a labor of love, but I do have to eat. We receive no Foundation, government, consulting, private environmental group funding, grants, or salary income. We accept no advertising revenue or reader fees. We work solo and rely on no “fundraising/development/promotional” or “public relations” staff flacks. We provide all this work for free. NJ Audubon Supported Preservation of Highlands Forests, Not Logging – What Explains The U-Turn? Why Is The Bergen Record Misleading Readers and Protecting Dupont? Today we have some news from New York, which we use to focus on the NJ side of the story and the larger energy infrastructure and climate policy implications. A regional fight between utilities could end up costing the New York Power Authority dearly if a decision by the Federal Energy Regulatory Commission doesn’t go its way. At the center of the fight is the Hudson Transmission Partners (HTP) line between New Jersey and New York City — so far an underperforming investment by New York State that now could be saddled with hundreds of millions in additional costs. The 660-megawatt transmission line has underperformed since it opened in 2013. NYPA is the leaseholder for the line and has to pay for 75 percent of its capacity whether it delivers electricity or not. So far, the line has delivered far less than needed to make it profitable. In June, POLITICO reported that NYPA could shell out $500 million by 2020 for the line. The HTP boondoggle exposes the big lie about “reliability” that the fossil energy industry repeatedly uses to justify needless fossil infrastructure projects to boost their profits. 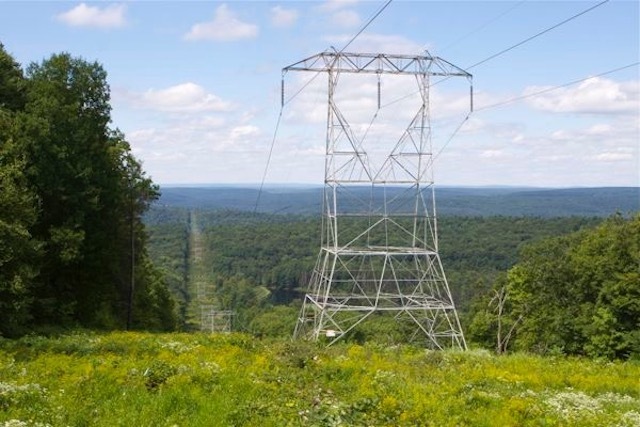 The HTP line was a component of the controversial Susquehanna – Roseland Powerline (SRP) through the Delaware Watergap and NJ Highlands. In the FERC rate recovery tariff for this project and three others , the Susquehanna-Roseland line is committed to serve points east. This purpose and commitment is evidenced by firm transmission withdrawal rights established for Neptune Regional Transmission System (Neptune) at 685MW and East Coast Power (ECP) at 330MW, totaling 1,015MW of firm transmission withdrawal rights. The PJM tariff assigned cost responsibility for the Susquehanna-Roseland to Neptune and ECP, based on these firm transmission withdrawal rights. This 1,015MW is soon to be joined by Hudson Transmission Partners at 670MW. Exhibit STL-12, p. 8 (firm transmission withdrawal rights allocated and Susquehanna-Roseland cost allocation regarding those firm transmission withdrawal rights); Ex. S-96, Hudson Transmission Partners firm transmission withdrawal rights of 670MW presumed in staff base case). The firm withdrawal rights from the Roseland substation already in the tariff at 1,015MW plus that of the Hudson Transmission Partners (HTP), 670MW, which will be added as soon as the interconnection agreement is signed, totals 1,670MW or more committed. Q. Please describe the purpose of your testimony. Can you even imagine the kind of warped power engineering mentality that views the lovely Wild & Scenic Delaware River as a “constraint” to expansion of coal based markets? That allows those views to dominate energy policy? [End note: In a 2008 post about legislative hearings on proposed PSEG NJ exports to NY, we questioned how new energy infrastructure for NJ was needed when NJ exported large amounts of power to NY City. The testimony of PJM representatives should be required reading – a primer on the economic and regulatory policy barriers to reducing coal based global warming emissions and market entry/access restrictions to renewable power technologies. The PJM primary goal is system reliability – with reliability viewed very narrowly as limited to increases in power production and distribution. As a result, economic regulatory policies provide incentives for more traditional power production that undermine energy conservation and renewable power.For example, no one mentioned the concept of a “carbon adder” to make dirty coal power prices reflect their true staggering environmental costs. The Committee took no testimony from environmental experts or those concerned about global warming.